Samsung shows-off world's largest 110in 4K Ultra HD display | What Hi-Fi? 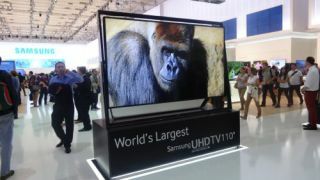 Samsung showed-off the world's biggest 4K Ultra HD display at IFA 2013 in Berlin today, a 110 inch, bigger-than-a-person monster. It was joined on the Samsung IFA stand by a 98in UHD screen – Samsung isn't doing things by halves when it comes to big-screen 4K displays, then. Previously, we'd had to make do with 84in 4K TVs – you can read all about them on our 4K TV reviews page. Details on the two screens are thin on the ground but we know that the 98in Ultra HD "Large Format Display" can be installed vertically or horizontally, while you can also connect multiple screens together to form huge video walls. Samsung has manouevred three 98in screens side-by-side vertically at IFA to create a 171in video wall. And it's not all about being the biggest: Samsung has its first 31.5in UHD monitor on display, packing 8.3 million pixels in to the relatively small screen size. There's no word on whether any of these screens will become available to (deep-pocketed) consumers, but it clearly shows Samsung is stretching its 4K manufacturing muscle.